Sudlichster Theil von America enthaltend Bolivia, das sudliche Brasilien, Paraguay, Chile, La Plata, Cisplatina und Patagonien. 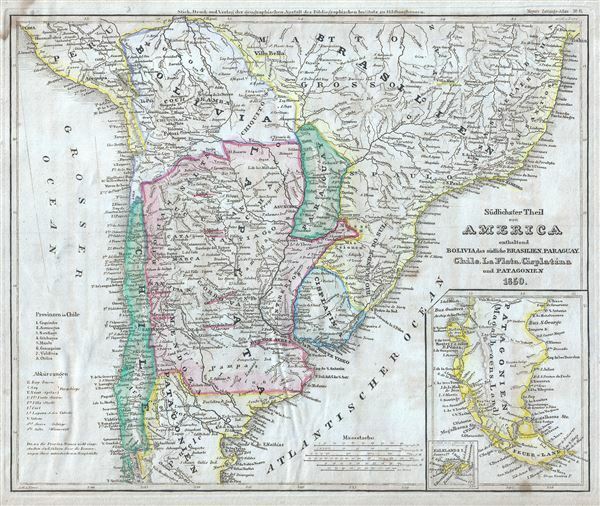 This is a fine 1850 map by Joseph Meyer depicting Chile, Argentina (La Plata, including parts of Patagonia), Paraguay, Uruguay (Cisplatin), Bolivia and parts of Peru, and Brazil. Bolivia's claims to the Atacama Desert and Peru's claims to Moquegua - both of which are today part of Chile are noted. As this map was being drawn, the region was gaining its independence from Spain. Following General Jose de San Martin's defeat of the Royalist forces and the subsequent liberation of Argentina, European and other Latin American settlers flocked to the region with dreams of rich farm lands and other natural wealth. This map was issued as plate no. 81 in Meyer's Zeitung Atlas. Although all the maps in this atlas are not individually dated, the title page and maps were often updated while the imprint with the date was not, causing confusion to the exact date for some of the maps. Moreover some maps in the atlas were taped in at a later date as an update to the atlas. We have dated the maps in this collection to the best of our ability. Very good. Minor overall toning and some foxing at places. Minor dampstain top left margin. Map of New York and Vicinity pasted on verso.